Here’s my personal summer favorite. 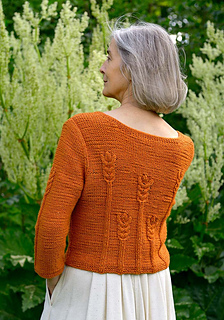 The basic design is derived from the bodice of the Rye Cardigan in my book 25, Garden Delight. 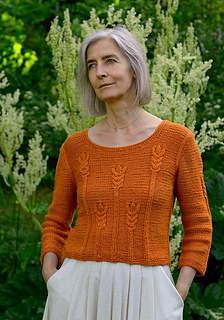 For Grainne I’ve turned it into a sweater, echoing the motifs on a three-quarter length sleeve. The pattern is charted. I have a short upper body and look best in short sweaters. 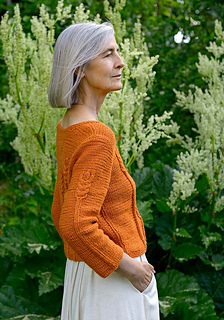 If you prefer a longer version you can easily add length at the bottom of the sweater.